Istanbul, Turkey (June 23, 2015) – Polin Waterparks is proud to announce that its Super Combo Waterslide won a 2015 MVP Award from Aquatics International magazine. The magazine’s readers vote for the Most Valuable Products annually and narrow down the contenders to the 25 best new products of the year. The acknowledgement of Aquatic International magazine’s readers of their innovative combination slide is a reflection of the rising trend of these types of aquatic attractions in the waterparks industry. “Our designers are perfectionists when it comes to developing state-of-the-art slides that pump up your adrenaline while also being incredibly safe. So being able to build on our pains taking investment in these products’ development and create completely new products for our customers and their guests is win-win-win for all of us. Our designers are elated to see their creations – which are already proven popular and successful – gain even greater use and longevity. Our clients are happy because their ongoing challenge is to find new ways to keep customers coming back, which is a real advantage of our hybrid/ comibination offerings. And, of course, guests are on cloud nine to discover new and even more thrilling rides.” Says Ali Cansun, R&D manager, Polin. The development of hybrid attractions allows Polin to offer multiple and even more exciting slide paths, along with unexpected G-force changes. Specifically, in regards to the Super Combo, Polin has combined four rides into one, including Polin’s Sphere. The Sphere rockets riders into a dark, orbital-shaped slide that loops around several times before riders make a splash landing. Because of the Super Combo’s unique ride path, no ride is ever the same, making it exciting for guests to ride again and again. 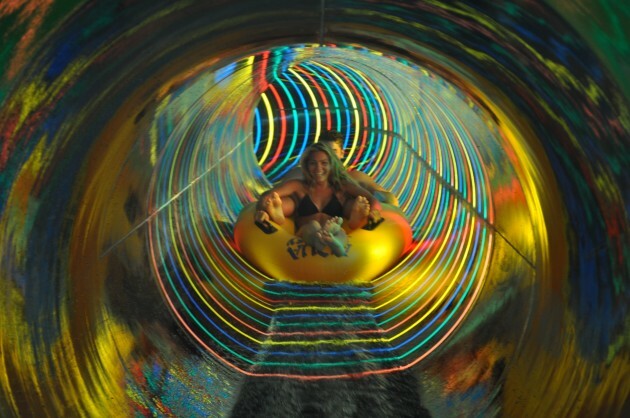 Super Combo is first installed at Aquafantasy Waterpark in Izmir, Turkey. * Amaazia Waterpark (Surat, India).